I putt with the same method today that I used when I began playing golf at age 15. 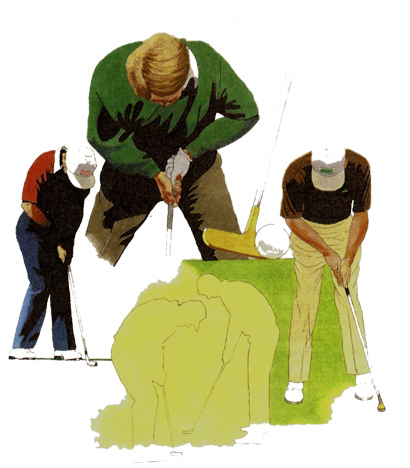 I hold the putter with a reverse overlap grip, stand rather tall to the ball in a slightly open stance, and use a stroke that works like a door opening and closing, similar to Ben Crenshaw's. I don't necessarily recommend this method to you. Each of us should find a putting technique that suits us. The method I've described works for me. However, for a period of seven years I abandoned this method. Back in the 1978 British Open at St. Andrews, five-time British Open Champion Peter Thomson told me I'd never be a great putter with the method I had. So for seven years I tried to change. Those were the worst putting years of my career. And that experience has left me with the conviction that if you have a putting method that works for you, you should never try to fiddle with it. If your stance and stroke feel natural, and if you can get around the course in 31 putts or better consistently, stick with your method. I don't care whether you putt stiff-wristed, flippy-wristed, cross-handed, knock-kneed, or standing on your head. If it works, stick with it.